ANKARA, Turkey—Turkish Prime Minister Recep Tayyip Erdogan on Wednesday reshuffled his Cabinet after three key ministers resigned over a sweeping corruption and bribery scandal that has targeted his allies and rattled his government. Erdogan replaced Economy Minister Zafer Caglayan, Interior Minister Muammer Guler and Erdogan Bayraktar, the minister for the environment and urban planning. All three men’s sons were detained as part of the corruption investigation. They all deny any wrongdoing. Erdogan also replaced the minister in charge of relations with the European Union who was also implicated in the probe but had not resigned. In all, Erdogan replaced 10 ministers, including three who will contest mayoral elections in March. 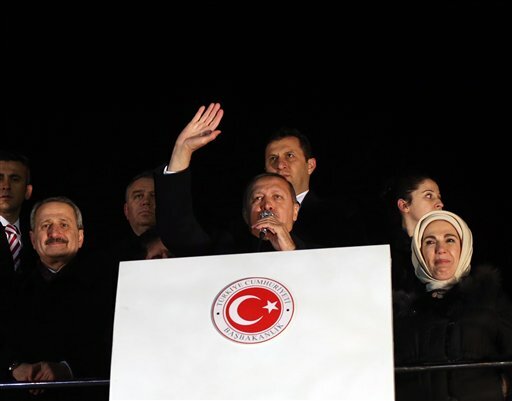 The corruption probe is one of the biggest political challenges Erdogan has faced since his Islamic-based party narrowly escaped being disbanded in 2008 for allegedly undermining Turkey’s secular Constitution. This summer, he also weathered a wave of anti-government protests sparked by a development project that would have engulfed an Istanbul park. Erdogan has denounced the investigation as a plot by foreign and domestic forces to thwart his country’s prosperity and discredit his government ahead of local elections in March. His government has won three elections since 2002 on the strength of the economy and a promise to fight corruption. Turkish commentators believe the probe is fallout from an increasingly public feud and power struggle between Erdogan’s government and an influential U.S.-based Muslim cleric, Fethullah Gulen, whose followers are believed to have a strong foothold within Turkey’s police and judiciary. The two men, without naming each other, have been engaged in a war of words since the corruption probe was launched on Dec. 17. Gulen has denied being involved in the investigation. He left Turkey in 1999 after being accused by the then-secular government of plotting to establish an Islamic state. He was later cleared of that charge and allowed to return to his homeland, but he never has and is living in Pennsylvania. In Istanbul, meanwhile, police clashed with hundreds of protesters demanding government’s resignation, Dogan news agency reported. Authorities have arrested 24 people on bribery charges, including Caglayan’s and Guler’s sons, along with the chief executive officer of the state-run bank Halkbank. Bayraktar’s son, Abdullah Oguz, was detained as part of the probe but later released from custody. Media reports said police seized $4.5 million in cash that was stashed in shoe boxes at the home of the bank’s CEO, while more than 1 million dollars in cash was reportedly discovered in the home of Guler’s son. As he resigned Wednesday, Caglayan questioned the legitimacy of the investigation, which is focusing on alleged illicit money transfers to Iran and alleged bribery for construction projects. In a telephone interview with NTV television, Bayraktar also denied any wrongdoing, complained of being pressured into resigning by Erdogan and insisted “a great proportion” of construction projects that are allegedly under investigation were approved by the prime minister himself. “I want to express my belief that the esteemed prime minister should also resign,” Bayraktar said. Guler, the interior minister, told reporters Tuesday that he is the victim of a political plot and that there is nothing his family could not account for. He also said alleged wiretap recordings of a conversation with his son — reportedly used as evidence by police for the arrests— were tampered with, and that the cash discovered in his son’s house was money earned from the sale of a luxury villa. In a further headache for Erdogan, lawmaker Idris Naim Sahin — whom Erdogan removed as interior minister in an earlier reshuffle — also announced his resignation from the party, while the Ankara prosecutor’s office said a separate probe had been launched into alleged irregularities in the awarding of high-speed train contracts. In an address to his party’s provincial leaders, Erdogan distanced himself from the ministers who resigned by emphasizing his party’s record and determination to fight corruption. But he also repeated a claim that his government was the target of an international plot. “There are media institutions, organizations and gangs in Turkey who think of others’ interests rather than their own country’s interests, and are working as spies in a treasonous manner,” Erdogan said. Last week, Erdogan threatened to expel ambassadors from Turkey after four pro-government newspapers accused U.S. Ambassador Francis J. Ricciardone of scheming against the government. That prompted a new rebuttal from the U.S. Embassy. “Allegations targeting U.S. Embassy employees published in some media organs do not reflect the truth,” the embassy said.